Hello all, I am currently a PhD student and I am looking at datasets from GEO and trying to merge them together and starting to analyze overlapping genes. Does anyone have input onto how to do this? You will have to show us some lines from the files and tell us what exactly you are trying to accomplish. You need to provide far more detail about what, precisely, you want to do and the type of data involved. I think pasting gene names as "text" in excel should take care of most of the problems. 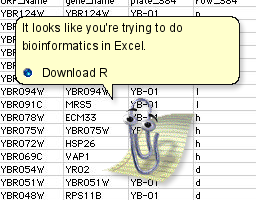 Sometimes, excel is handy if you do it carefully. But as Irsan says, vast majority of users do not do it carefully. The point-and-click mentality does not encourage thoughtful reflection. I would export them as tsv or csv and run the command join from a linux/mac command line. I think it would be prudent for you to pick up MySQL. SQL is (kinda) like a spreadsheet but it enforces data types and may help you avoid the aforementioned pitfalls of excel. For more info Bioinformatics paper reference; InSilico DB and InSIlico Merging packages links, and blog link. Save your Excel sheet from each sample as a comma-separated file in a given folder within a "Main_Folder" folder. The contents of the file should be [Feature],[value] and folder name be the sample name. All csv file should share a common string as a name (e.g. *_data.csv) for us to grep them. How can you merge more than two 10x datasets in Seurat? How To Merge Two Microarrays Datasets?